If you’re an urban bicyclist, you probably know what “dooring” means. When bike lanes are entirely within reach of the doors of legally parked cars, it’s harder for bicyclists to ride safely. Even the cyclist who knows it’s not safe to ride in the door zone may feel that riding in the lane adjacent to an unusable bike lane is like riding with a flashing “Harass Me” sign. Why do cities continue to make it hard to ride safely? I address this issue in a new article in the journal Accident Analysis and Prevention. Door zone bike lanes (DZBLs) continue to be installed because design guidelines still allow them. For decades, it has been conventional wisdom that crashes involving bicyclists and opening car doors are rare. This belief is based on motor vehicle crash reports, but these reports generally exclude this crash type by definition. National and state databases only include crashes involving motor vehicles in transport. Since a parked car is not in transport, and a bicycle is not a motor vehicle, crashes where a bicyclist hits a parked car door are excluded. A few dooring crashes make it into national and state crash databases anyway, which has led some studies to erroneously conclude that dooring accounts for less than 0.2 percent of bicycle crashes. 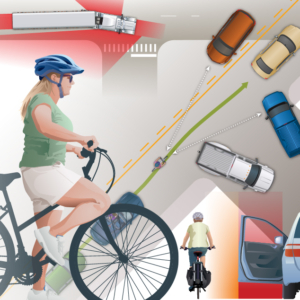 Dooring accounts for 12 to 27 percent of urban car-bike collisions, making it one of the most common crash types. I reviewed four studies of bicyclist riding position with bike lanes and parking lanes of varying widths. With the minimum dimensions allowed (5-foot bike lane and 7-foot parking lane), almost all bicyclists were observed riding within reach of parked cars. However, when there was another three feet between the bike lane and parked cars, almost all bicyclists rode outside the door zone. When there was another three feet between the bike lane and parked cars, almost all cyclists rode outside the door zone. Only one of the North American bike lane design manuals I could find (the Ontario Traffic Manual) requires a buffer between bike lanes and on-street parking. Paradoxically, the guidelines for separated bike lanes — where the bike lane is on the curb side of on-street parking — all require one. Why require a buffer from car doors when the bike lane is on one side, but not when it’s on the other? The report found that bicyclists need to center themselves 12 feet from the curb to be outside of the door zone. The Transportation Research Board’s report recognized best practices. Yet its authors still recommend installation of bike lanes that are less than 12 feet from the curb. Even where there was enough room for a door buffer zone, the report recommended using half of the buffer zone on the travel lane side. The authors are aware of the problem with their own recommendations. 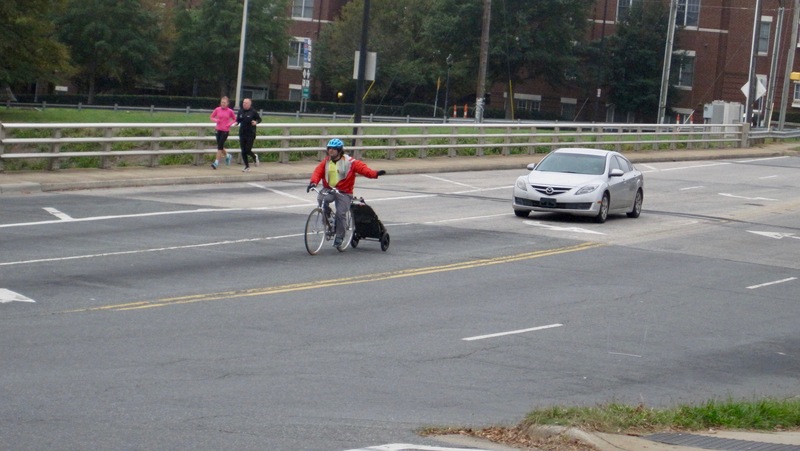 “Where bicycle lanes are designed according to the guidance [in this report], it should be recognized that bicyclists will still likely position themselves within the door zone of parked vehicles,” they wrote. 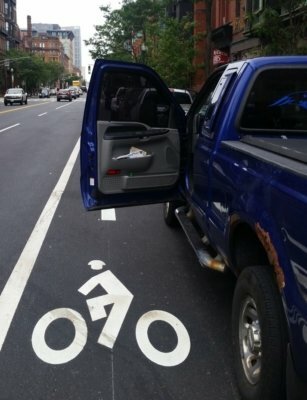 Some say that cyclists will ride in the door zone, even when not directed to by DZBLs. But is this really so? 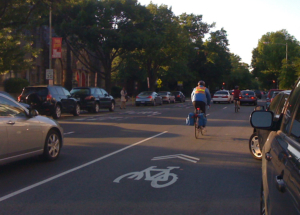 I looked at four studies that observed the position of bicyclists before and after shared lane markings were added in the center of a travel lane adjacent to on-street parking. 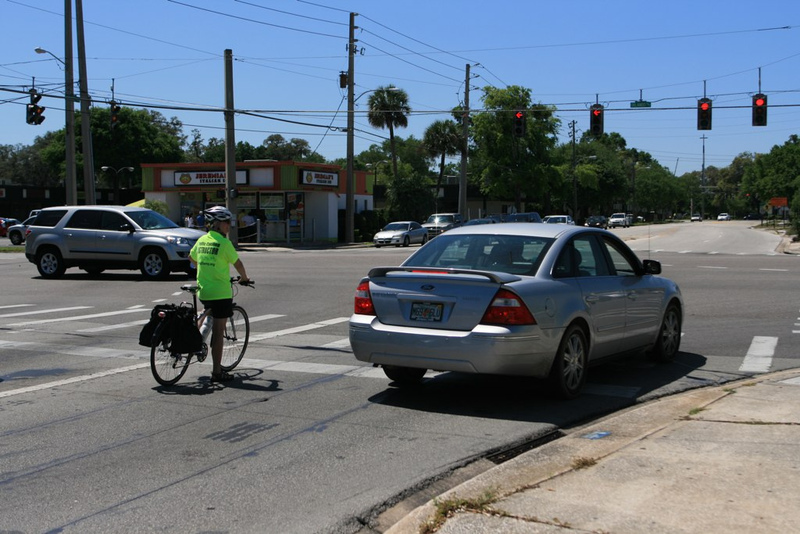 The SLMs were centered about 14 feet from the curb; on average bicyclists were centered 11 feet from the curb. In the most successful case, 85 percent of bicyclists were riding within the door zone before SLM installation, and only 45 percent after. In addition, there was a large drop in sidewalk bicycling. The posted speed limit was 25 MPH in this case, compared to 30-35 MPH in the others studied. 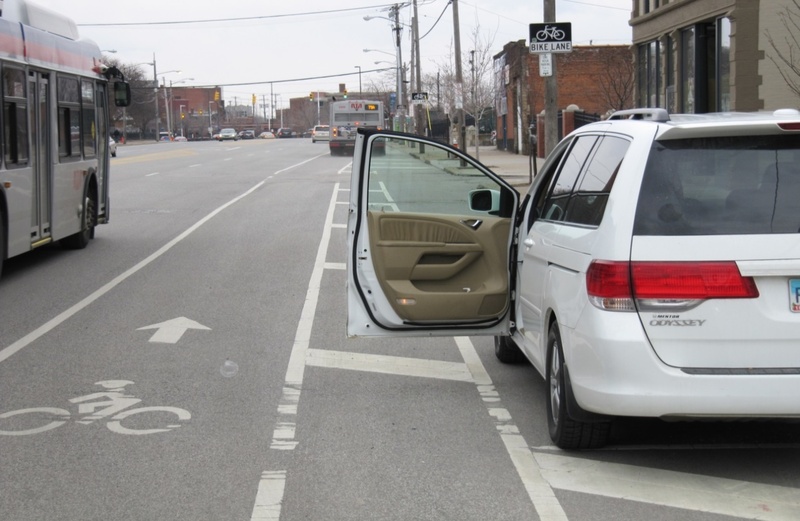 Where there is on-street parking and insufficient room for a buffer from doors, SLMs can help keep cyclists out of the door zone. 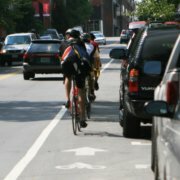 They could be more effective if supplemented by lower speed limits, eliminating statutes that require bicyclists to have an excuse to leave the right edge of the road, retraining police officers, and making the public aware of the right and need of bicyclists to keep a safe distance from parked cars. 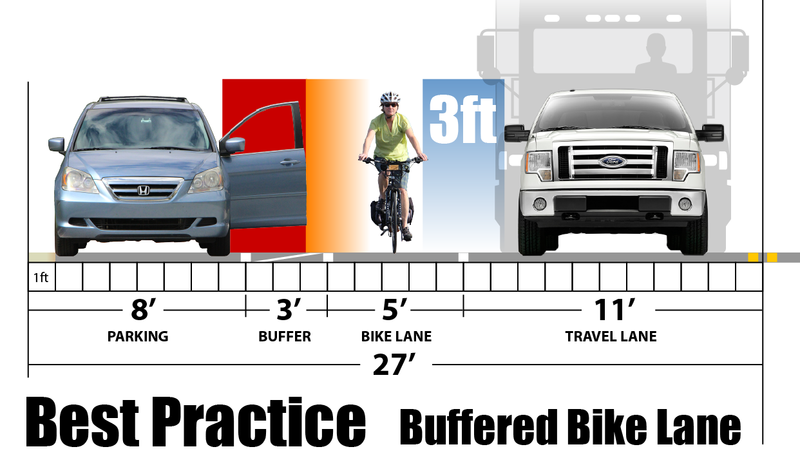 Requiring a buffer for standard bike lanes will require design guides to acknowledge that bike lanes do not fit next to on-street parking without at least 3 feet more of width than is currently provided in the minimum guidance. 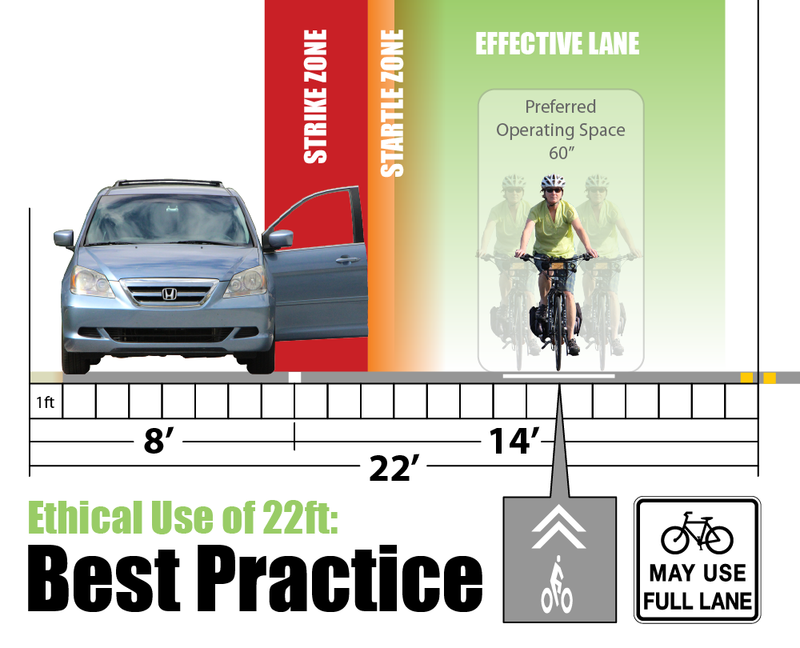 With less than 25 feet for a parking lane and travel lane, bicyclists should be encouraged to ride in the travel lane with shared lane markings and Bicyclists May Use Full Lane signs. 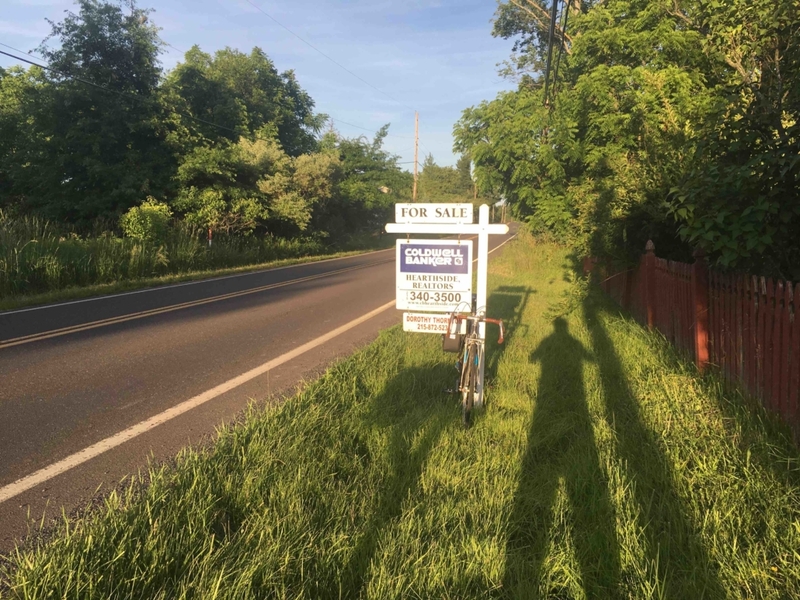 Currently the American Association of State Highway and Transportation Officials (AASHTO) Guide for the Development of Bicycle Facilities is being revised. However, unless the committee reviewing the current draft intervenes, DZBL designs will be retained. Although there will be new material on buffered bike lanes, the primary concern is a buffer between the travel lane and the bike lane, not on the parking side. Accounting for the door zone properly would mean that bike lanes could not be installed with less than 25 feet between the curb and the center line. There’s a pervasive belief, unsupported by evidence, that bicyclists using travel lanes are likely to be hit by overtaking motorists. Following this belief, the new AASHTO guide not only maintains designs that essentially require bicyclists to use the door zone, but also promotes designs requiring bicyclists to stay to the right of right-turning traffic. Another pervasive belief is that bike lanes make bicycling easier. In fact, cyclists need more education to safely use bike lanes in urban contexts. The dooring risk is merely one of a host of issues with DZBLs. If possible, find another route. If you find yourself on a road with a door-zone bike lane, you could use it with CyclingSavvy’s “control and release” strategy. Because of traffic lights, motorists tend to travel in platoons. This leaves even busy roads empty for various stretches of time. When the regular travel lane is empty, use it, moving over as necessary to the door-zone bike lane to “release” other traffic. When you move into any door-zone bike lane, slow down. Go slow enough so that a door opening in your path will not surprise you. For safety’s sake, this won’t be much faster than walking speed. Be aware that while you’re in the bike lane, you’re not relevant to motorists. Beware of drivers who may turn right in front of you, or left across your path. 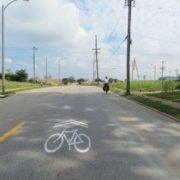 A door-zone bike lane also shields you from motorists who may be driving onto the road at an intersection or from a driveway. Never use a door-zone bike lane as a “freeway” to speed by motor traffic stopped and stuck on your left. In these situations, filter forward cautiously (no faster than pedestrian speed). If door-zone bike lane designs proliferate, savvy cyclists will increasingly have to take longer routes in order to avoid the possibility of harassment (or citation, in cities and states with mandatory use laws for bike lanes). The door zone is a real hazard that must be accounted for in designing for safe bicycling. 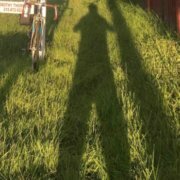 I am a proud savvy cyclist…and I have a confession. 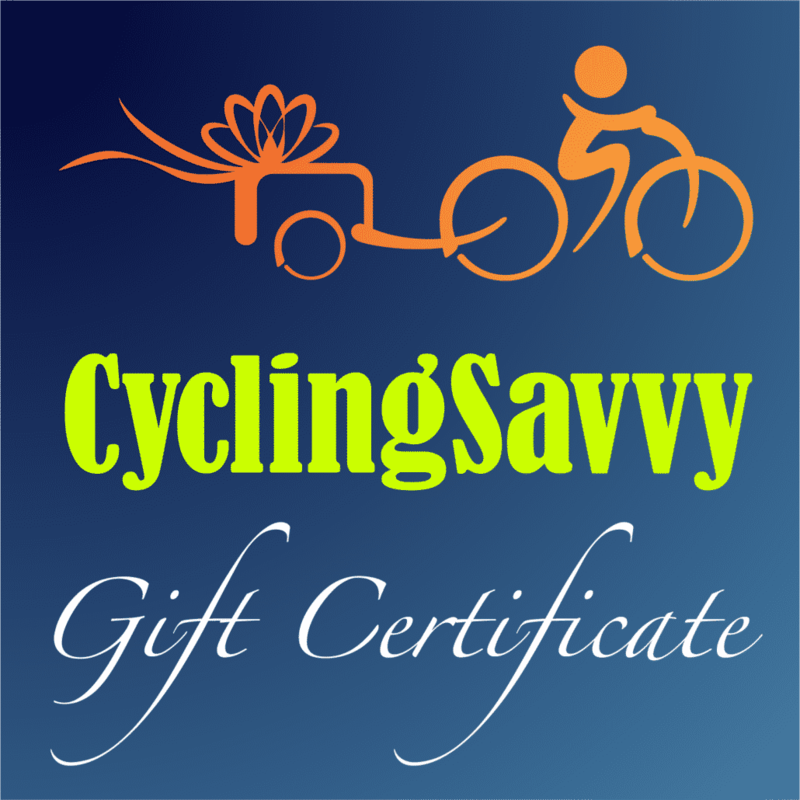 I took CyclingSavvy twice, first in Philadelphia and then Charlotte. You might ask: Didn’t I learn anything the first time? I learned an incredible amount about training my bike and how to ride comfortably and confidently with traffic. But some things don’t sink in until later or, in my case, the second time around. In Philly, I learned from Karen Karabell that there’s nothing scary about empty pavement behind you. How do you get “scary” roads to yourself? You make the lights and the law work for you. A great example is choosing where you enter a road from. Use traffic lights to your advantage by turning right on green. You have no obligation to turn right on red. By turning right on green, motorists on the road you’re turning onto are stopped at a red light. When they finally get a green, they’ll be far enough back to use one of the adjacent travel lanes to pass you, in whichever lane you’re not in. We practiced the right-on-green technique in Charlotte, too. Before I tell you what happened, you need to know that the on-road Tour is like nothing you’ve ever done before. You’ll be riding on roads you can’t believe you’re using — and you’ll be doing it by yourself, unless you don’t want to. Then an instructor will ride with you. But by the time you get to that point in the workshop, almost everyone wants to try on their own. As a savvy cyclist, I’m not a road warrior. Just the opposite! 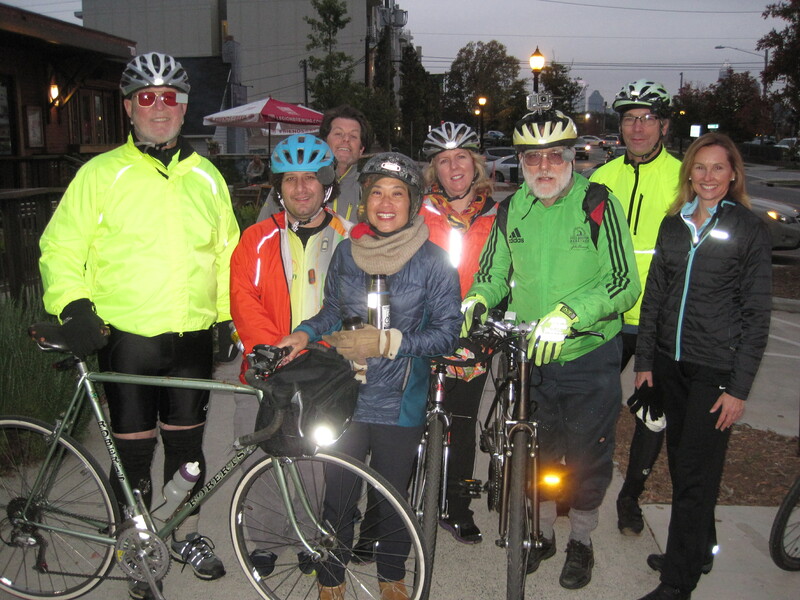 CyclingSavvy instructors teach strategy, courtesy and mindfulness. 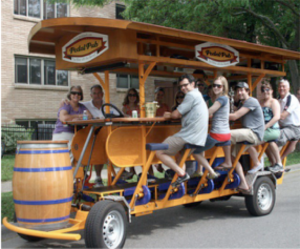 They figure you’re probably OK riding on your neighborhood cul de sac, or on a trail. What they want is to show you how to make connections, so that you can ride out of your neighborhood, or not have to put your bike on a car to go to the trail. 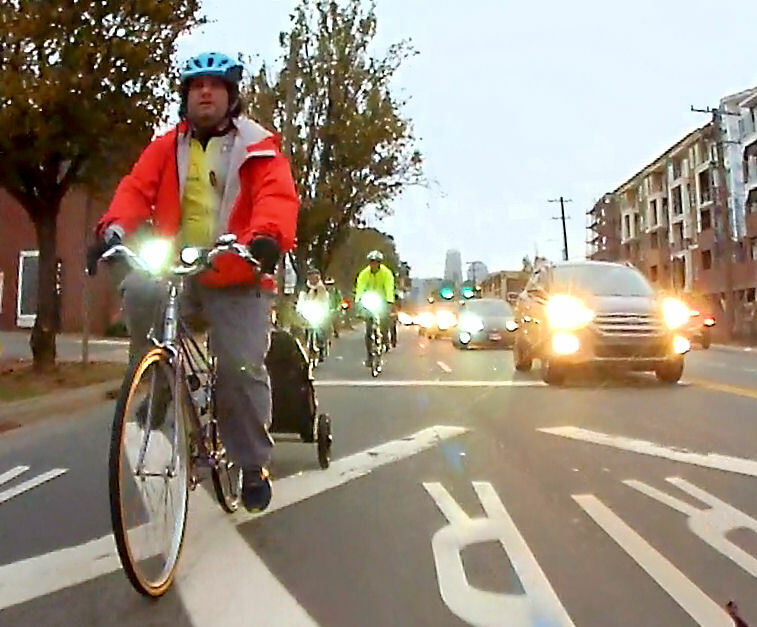 In Charlotte, we watched each student set off to practice right-on-green. It was a busy road and motorists would appear behind them. John Allen instructed the students to move to the left side of the lane and wave the motorists to pass on their right. Staying to the left side of a lane allows motorists to turn right on red while you wait for a green light. The motorists passed and made the right on red. When the light turned green, the student doing the feature would turn right. The result was obvious: No cars on the big “scary” road behind the student. By turning right on green, motorists on that road were held back by a red light. After making the turn, we were instructed to go directly into the lane we wanted. Motorists turning right on green with us could choose another lane and pass us easily. Instructor Pamela Murray shook my thinking about shoulder checks. I use a helmet mirror, so some shoulder checks seemed unnecessary in my mind. 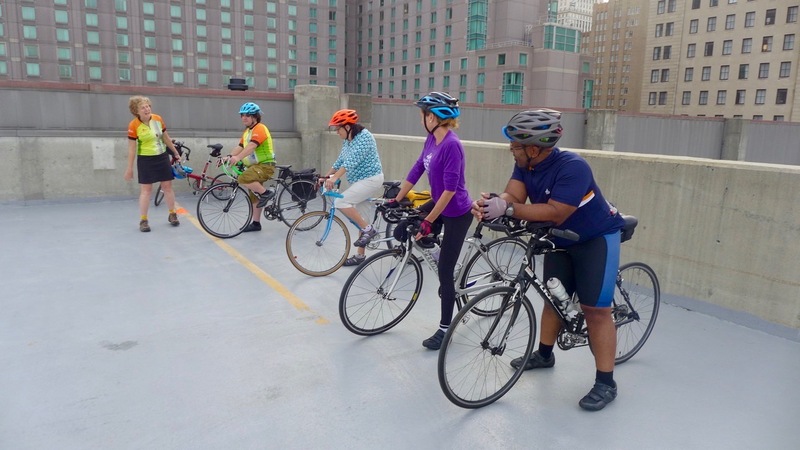 Before taking CyclingSavvy in Charlotte, I only did shoulder checks when making lateral movements. When I merged or turned, I’d do a shoulder check, signal, and shoulder check again to make sure it’s safe. Otherwise, I just used my mirror and then communicated with hand signals like “slow,” or “pass” when it was safe to pass me. What this does, though, is make it seem like the motorist is communicating with just an inanimate piece of metal. When you turn your head over your shoulder, you’re showing your face to the person behind you and making yourself recognized as another human being, not just a bike. As a result of seeing your face, they’ll be more apt to take direction from you. People like to help other people out. I’m grateful for the incredible, knowledgeable CyclingSavvy instructors who’ve helped change my street game into a savvy cyclist dance. Yes cycling with kids. On streets! 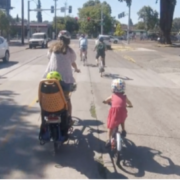 Check out this video of a family riding regular streets to Sunday Streets in Eugene, OR. Starting and stopping skills are essential, for obvious reasons. It’s important for the child to be able to ride in straight line. The child must have the attention span and willingness to mind an accompanying adult. As you can see in the video, these skills can be had by children as young as 4 years old. Be comfortable with lane control so you can ride to the left of your child. Make sure you are knowledgeable about the door zone and other edge hazards. Have good situational awareness so you can anticipate any developing issues in plenty of time to communicate with your child. The best infrastructure for getting started cycling with kids on the road is a low-speed street with no special bike facilities. * It allows the adult to ride next to the child. This is known as the Wingman position. You saw it in the video with the mom riding to the left of the child. This allows mom maximum vantage for any potential conflicts, while also being able to see and speak to her daughter. For more information about cycling with kids, see this article by Steven Goodridge. *Except for perhaps well placed shared-lane markings (sharrows) and BIKES MAY USE FULL LANE signs. So. You probably saw this dashcam video of a cyclist escaping the wheels of a double tanker truck, while her bike was crushed. I’ve seen a number of other videos from dashcams or security cams where the outcome was horrific and heartbreaking. Those I would not post. 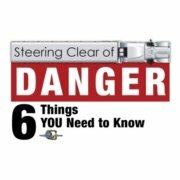 This video is a good teaching tool regarding safety around trucks, because it’s not graphic, and the outcome was good. I posted it on our Facebook page. Cyclists being crushed by trucks is a recurring tragedy. And it’s one that’s very personal to me. My point in posting was not to criticize the cyclist. I lament the fact that our culture does not value education enough to ensure that cyclists — really, all road users — understand how to avoid the risks posed by large vehicles. It doesn’t matter who’s to blame. We cyclists can keep this from happening to us. This is an empowering revelation, to me. And yet it seems to trigger some cyclists. I want to talk, again, about how to prevent this crash. I also want to talk about how the defensiveness surrounding crash prevention holds us back. I’m not criticizing the cyclist. I lament that our culture does not value education, and what cyclists need to know to keep themselves safe. Here’s what I found most fascinating and instructive about discussion on this video — not just on our page, but in other parts of the interwebs as well. In the video, the cyclist catches up and begins to overtake the truck as it is moving again from being stopped at a red light. For a few seconds, she’s visible to the camera. Then she disappears alongside the truck. Eight seconds later we see her again, as the cab of the truck turns to enter the driveway. Life or death, in eight seconds. In those eight seconds, many video watchers “saw” her pass the truck and the truck speed up and overtake her prior to the turn. It’s hard to pinpoint the exact location of the cyclist because of her size and distance from the camera, but a reasonably accurate estimated position is possible. There was not much speed differential between the truck and the cyclist. The length of that truck could have been almost a quarter of the distance she traveled. It is not possible that she passed the truck and it passed her again in the eight seconds she is hidden from view. She caught up to the truck and began passing as it was leaving a stop at a red light. Then it probably matched her speed and she was trapped beside it when it got to the driveway. She may have been in a blind spot — I have no idea what kind of mirrors or cameras the driver had at his disposal. So what can you do in that situation? First, if you know a stopped truck is going to pick up speed again, stay back and do not try to pass it. Never, ever pass near an intersection! If you do pass a truck and then find it is pacing you, hit the brakes. Let the truck get ahead of you as quickly as possible. If all else fails, do exactly what the cyclist in the video did. Take evasive action, jump off the bike and get away. Offering these steps to protect yourself in this situation is controversial. Apparently. This controversy is bigger than safety around trucks. For some people, it’s unacceptable to say anything other than reassure that the truck driver is guilty and the cyclist is blameless. The truck driver IS responsible for clearing the bike lane before turning. OK? But ALL road users are responsible to use due care to prevent crashes. Fault is a concept for civil litigation. It’s not a countermeasure. It’s certainly in the best interest of cyclists to avoid getting squished. But they can’t protect themselves if they don’t know what the risks are. I get it. Advocates are sensitive — with good reason — to feeling like bicyclists are blamed wrongly for crashes. Pay attention to cycling news and you’ll soon hear stories about the miscarriage of justice. The most egregious has a name and acronym: Single Witness Suicide Swerve, or SWSS. That’s when an overtaking motorist kills a cyclist, and then claims the cyclist swerved in front of him. 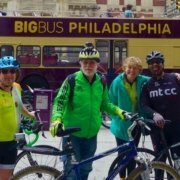 Dwelling on injustice is so intoxicating that entire websites are devoted to cyclist victimology. They get a ton more traffic than sites that promote education and empowerment. Yes, we must address traffic justice. I’ve written about it myself. But today and tomorrow — and for the foreseeable future — individual cyclists don’t benefit from outrage and finger-pointing. We benefit from knowing how to avoid becoming victims. 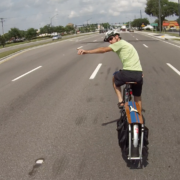 Individual cyclists don’t benefit from outrage and finger-pointing. We benefit from knowing how to avoid becoming victims. We have exactly zero control over what a truck driver can see, or how well he scans his mirrors. What we do have control over is not putting ourselves in compromising positions. But in order to have that control, first you need to have the knowledge. You have to be aware of the danger area and understand the risk. We as a culture — and specifically as advocates — have a responsibility to teach ALL cyclists that. that the driver should have scanned more vigilantly before crossing the bike lane. He had been stopped at an intersection that was 200 feet from his turn. There was plenty of time for a cyclist to catch up and begin to pass the rig. 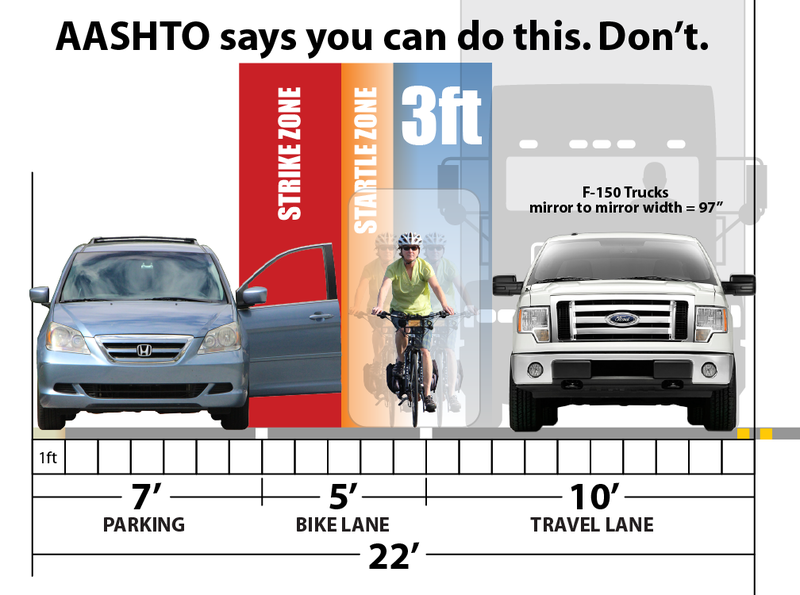 When operating around bike lanes, truck drivers need to be aware of this as much as cyclists do. But I can only imagine the horror that driver felt when he got out of the rig and saw the crushed bicycle. What might have happened is likely to haunt him. It would certainly keep me up at night. Hopefully, it will make him much more vigilant in the future. 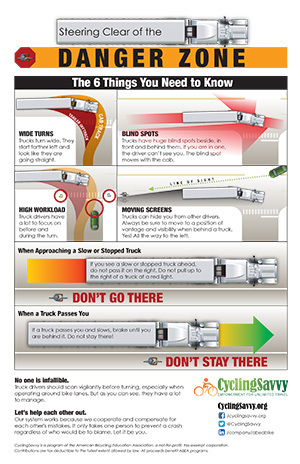 Anyone who has driven a truck knows that workload is high in the cab of a large vehicle. There are more things to pay attention to than what might be coming up from behind. Our system works because we compensate for each other’s mistakes. Knowledge saved my life. That’s why I’ve dedicated my life to sharing it. We do it all the time. A couple of weeks ago, I avoided being T-boned by a red light runner, because I looked left before I entered the intersection when my light turned green. Other drivers have certainly prevented crashes by compensating when I screwed up. I’ve had a few close calls that would have been totally my fault. I’m grateful the other guy was sharp and quick. This cyclist compensated, too. She made an evasive maneuver and managed to get off her bike and away from the rig. She must have been very shaken. It was a much closer call than my tractor trailer experience — which I’m getting to, I promise. My wish is for bike advocates to get beyond the kneejerk need to blame or defend. There’s no good to come from “othering” truck drivers, either. Making a mistake that kills someone is horrible. It causes massive psychological damage. It pains me to read comments demonizing the truck driver. He’s a person, too. If we want to save lives, let’s ask: What can we learn from this? What can we teach other bicyclists — and our children — so they don’t become victims of their own, or someone else’s, mistakes. The majority of the time we spend on the crash-avoidance section of CyclingSavvy is on avoiding the consequences of other people’s mistakes. We don’t focus on blame. We simply recognize the immutable reality that humans make mistakes. With motorists, those mistakes are amazingly predictable. You can get hung up on being mad about that. I prefer to be grateful. Predictable mistakes are so much easier to avoid! No amount of chest-thumping or demanding justice is going to make people stop screwing up (that includes you and me). Years ago, motorist errors plagued my existence. I complained constantly. I insisted there had to be a way to change their behavior, and generated a lot of negative energy around it. Then one day, in my perennial search for how to fix motorists, I happened upon some educational content for cyclists. It told me ways that I could change my behavior. I wasn’t looking to change my behavior, darn it! I honestly didn’t think it would work, but I tried it. It not only worked, it changed my world and my worldview. The motorists didn’t change. They still make mistakes. The difference is, I’m very rarely in a position to be affected by those mistakes anymore. Now I’m going to tell you why I’m still alive. I might have died here. 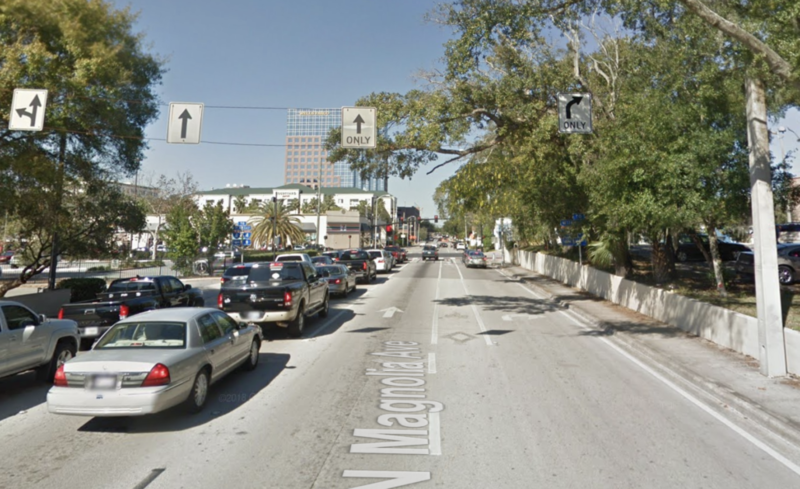 Eleven years ago, I was riding north on Magnolia Avenue through downtown Orlando. I was in the bike lane. I had turned onto the street a few blocks before the big intersection at Colonial. A block before Colonial, I caught up to a slow-moving truck in the right lane. I slowed and hung back. I knew about blind spots and wide turns. I’d been exposed to it in the Motorcycle Safety Foundation course, and then more intimately, when I illustrated the Driving Survival Guide for AAA. As we approached Colonial, the light was red. The bike lane continues to the intersection to the left of the right-turn-only lane. The truck remained in the lane to the left of the bike lane, slowing to stop at the intersection. There was no indication or expectation that truck would turn right on Colonial. But I have a very strong aversion to riding alongside a truck. I know how wide they turn. I’ve seen them turn right from a left lane. I refuse to take a chance, no matter how remote. I left the bike lane and pulled into the left-tire track of the thru-lane, to stop behind the truck. Just as the truck reached the Colonial intersection, the light turned green. At that moment, the driver turned on his right-turn signal and began to turn right. He turned across the bike lane and the right-turn-only lane. The truck driver was as wrong as he could be. He didn’t signal until the last second and he turned from a thru lane with no warning (there is an approach setup for this type of turn). He may have checked his mirror for cars in the turn lane, but he probably would not have seen me. If I had been there, I would have been caught by surprise, and in all likelihood, killed. I passed the trailer on the left as it completed the turn. I recognized what would have happened had I made a different decision… if I had not known what I did. I wondered how many other cyclists would have made the same decision. What never occurred to me was to be angry with the truck driver. Maybe I was too busy being grateful (and pleased with myself). This was a pivotal moment. That’s why I’ve dedicated my life to sharing the knowledge that saved it. I’ve been working on this program for almost ten years now. In that time, I’ve seen too many heartbreaking stories about cyclists this information did not reach in time. Will you help save lives? The video below is an excerpt from our online course. You can also link to it here, or on our facebook page. There is also a web infographic of the poster on the right. The button below will download a PDF of the poster for you to print and distribute. I’d be so grateful to you if you’d share this message. Thank you for reading and being part of our mission. One of the things we teach savvy cyclists is that a bright sun, low on the horizon, can be a dangerous condition. Google “sun glare driving.” As with operating around big trucks, how to handle this condition is an essential need-to-know for cyclists. And I do mean essential. 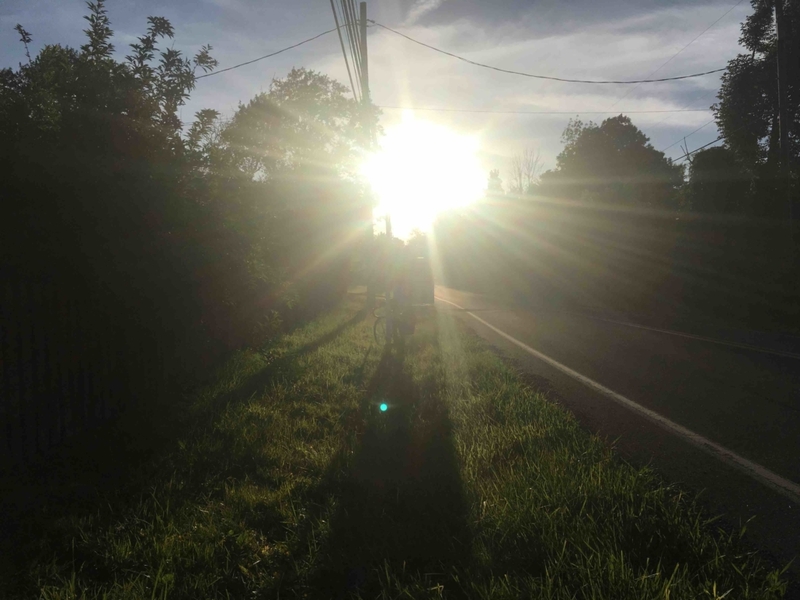 Earlier this month my friend Steve Magas chronicled the heartbreaking aftermath of a child killed by a sun-blinded driver in New Philadelphia, Ohio. 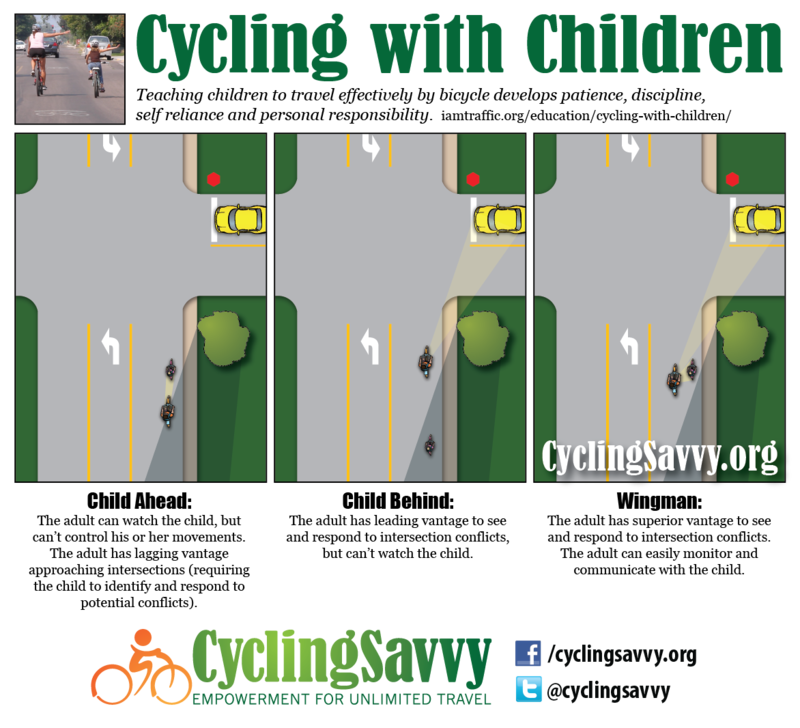 CyclingSavvy’s classroom presentation includes photos of how a bike can be hard to see in circumstances when the sun is in the eyes of another vehicle operator. Every driver of every vehicle should be mindful of that, but you don’t want to encounter a driver who isn’t so mindful. My riding seldom puts me in a position where I have to worry about this. But it happened on June 12. The longer the shadow, the greater the danger. I had gone on an important errand. My wife wanted a squirt gun, to do battle with squirrels that trespass our backyard bird feeder. And by gum, I headed straight for the nearest Dollar Tree and got her a good one. It’s a bazooka-style pool toy, with a range of 20 feet or so. On my way home from the store, the sun was low, less than two hands’ width above the horizon, glaring down the road and causing my eyes to squint. I found myself with a perfect example of “sun glare driving” blindness. The people behind me couldn’t see me. This was a narrow two-lane road, with no shoulder, no alternatives, and no intersection for the next few furlongs. After a minute of nervous-nellying, I knew what I had to do. I got off my bicycle. I moved to the other side of the road. And I walked. Now I was a pedestrian, easily visible to oncoming motorists. No problem. I stopped and took two photos. The photos aren’t perfect, because I couldn’t prop my bike in the roadway. Instead, I leaned the bike against a signpost in the grassy swale beside the road. Nonetheless, my photos make the point. Looking into the sun, straight ahead. Can you see the bicycle? Can you see my bike in the sun-in-the-eyes photo? You’ll have to look for a minute. Would you see it, if you were wearing sunglasses and looking through a dirty tinted windshield? Why risk that? In the away-from-the-sun photo, everything in front of you is visible. But even so, there are still hazards. Oncoming motorists can’t see you, and motorists at intersections in front of you can’t see you. So they might turn across your path. That’s the dangerous irony of this condition. When you’re riding along with the sun at your back, you might think everything’s crystal clear and hunky-dory. It isn’t! If the sun’s in your face, you may have to go for a walk like I did. If the sun is behind you, you can probably ride safely, provided you are very aware that motorist in front might not see you. So, that day, I decided I’d just mellow out and enjoy the walking interlude. And then the road shifted direction slightly, and a combination of terrain and tree canopy blocked the sun somewhat. I got back on the bike and rode the rest of the way. My decision to stay safe added five or 10 minutes to my trip time. That was time well spent to have 100 percent immunity against that crash cause. And my wife enjoys her squirt gun. 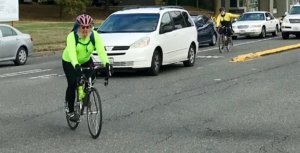 Today we celebrate something never done before regarding cyclist roadway position and what it really means to share the road. 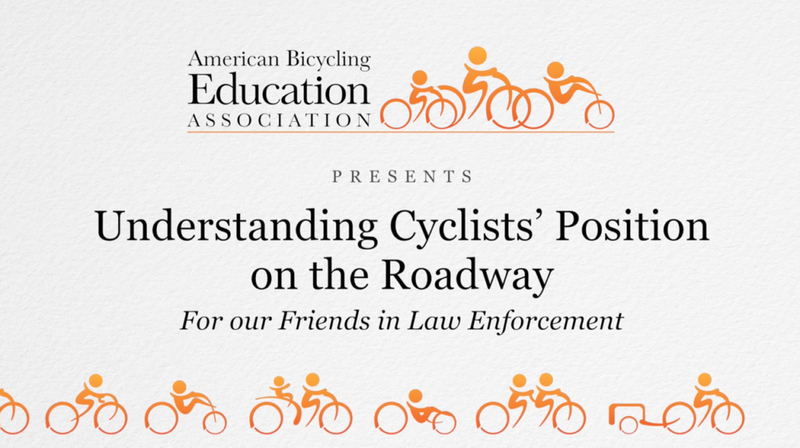 Created by CyclingSavvy co-founder Keri Caffrey and instructor Eli Damon, this video was unveiled today in Tampa at a law enforcement training class held by the Institute of Police Technology & Management. Finally, police have the opportunity to truly understand. IPTM is using this and other savvy cycling materials in its new course on pedestrian and bicycle safety. Finally, police have the opportunity to truly appreciate and understand the legitimate safety concerns and needs of cyclists. The course will soon be available to law enforcement nationwide, but you can help now. This isn’t just for law enforcement. Every motorist needs to watch this.